Of course there is an edit button. Around 130 Wikimedians attended the Wikimedia Conference 2009 in Berlin last month; they were Wikimedia chapter representatives, Wikimedia Foundation board members and staff, and software developers. This postmortem summarizes what happened, what went well and what could be improved in the next edition. a track for MediaWiki developers, hosted at the c-base. About 55 participants attended the chapters tracks, 10 people the board track and 60 people the developers track. Social activities where participants from all tracks could meet were proposed. The preparation was done on meta-wiki (April 2009 Wikimedia Conference, Chapters meeting 2009) and on mediawiki.org (Project:Developer meet-up 2009). A group was created on identica for quick information. The preparation and organization started two and a half months before the conference (mid January). The deadlines were roughly met by the organization team. All tasks requiring action from the participants were delayed of at least a week, sometimes much longer. Representatives from all existing Wikimedia chapters officially approved by the WMF Board attended the meeting: Argentina, Australia, Brazil, Czech Republic, Switzerland, Germany, France, Hong Kong, Indonesia, Israel, Italy, Hungary, the Netherlands, New York City, Norway, Austria, Poland, Sweden, Taiwan, the UK, Serbia and Russia. Several participants expressed their satisfaction about the fact that all chapters were present at the meeting. This was partly made possible by the financial help provided by sister chapters (see Finances below). Five participants (from Russia, Taiwan, Indonesia and Serbia) needed to get a visa in order to enter Germany. Wikimedia Deutschland provided them with invitation letters to facilitate the process, but the time needed to get these letters was longer than expected. At least one participant had to change his travel arrangements due to this delay, and as a consequence he had to leave the conference early. A few chapters needed convincing to attend the meeting. Most of the participants needing subsidizing for their travel expenses made special efforts to find low-cost flights. Each participant was given three one-day tickets to use public transportation in Berlin. They were also provided with a map and detailed indications on how to reach all the conference locations. Some participants complained that some itineraries were not ideal. We had some major issues with the venue. Our contact person at the T-Labs wasn't very accommodating and the conference suffered from the setup of the rooms (although the organization team did their best to arrange things to minimize the participants' inconvenience). However, the venue itself was great and the view was outstanding. Some participants complained that the food wasn't sophisticated enough (especially sandwiches on 2/3 lunches). They seemed satisfied with dinners & the party. Some of them also complained about the accommodation, but mainly about details (e.g. number of keys). All the chapters board members & foundation staff members were requested (several times) to provide input about what they wanted to actually discuss and work upon during the conference (Chapters meeting 2009/Brainstorming). This brainstorming was done in a wiki-way; it was supposed to last two weeks, but was extended to three weeks because of the lack of input from the chapters. The involvement of chapters in this brainstorming was uneven; some chapters did not even participate in it, even after several reminders. When the brainstorming was over, the output was broken down into specific key topics (Chapters meeting 2009/Topics). Identifying these topics was the first step needed to make a draft schedule (draft version of the schedule). Some feedback and complaints were taken in account and a revised schedule was proposed a few days later. Although all the topics raised during the brainstorming were added to the schedule, some chapters still complained that their wishes weren't taken into consideration enough. This may be explained by the very different expectations the chapters had. It was suggested to "group" similar chapters for future meetings using thematic self-discrimination. Some participants complained about the "State of the chapters" session and requested more time to present what their chapter was doing. However, lightning talks were precisely the point of this session: the goal was to present an overview and topics to be discussed during the rest of the conference. Besides, with more than 20 chapters already, it isn't possible to devote 15 minutes to each chapter (or The conference should last a week, see below). 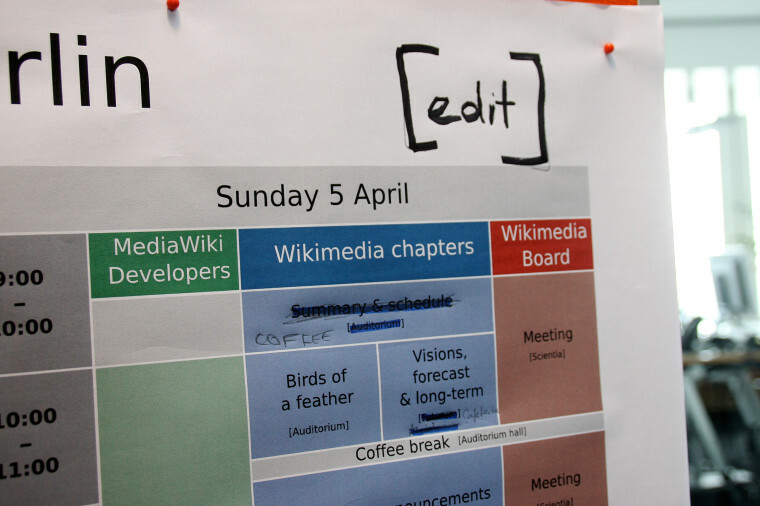 Many participants felt that there weren't enough time for informal meetings; most of them expected a Wikimania-like event (with a lot of socializing), whereas the conference was designed as a professional meeting. Many participants felt that the "State of the chapters" session was too short; however, at the same time, their involvement in preparing it was very low. This session was the only one for which a preparation was requested to the participants (Chapters meeting 2009/Preparation), and many of them didn't do it on time. That prevented the other participants from having a better look at them, and also prevented the organization team from preparing posters to be displayed in the conference hall with this information (as a support for informal discussion). Some participants prepared their presentation the night before the conference, or even the morning during the others' presentation. A call for volunteers was made on de.wikipedia.org. There wasn't enough volunteers to take notes for written documentation during the sessions. However, all the sessions used Metaplan boards for moderation / facilitation, and we had a few volunteers who took pictures of the boards. This way we managed to document the essence of all discussions. The photographers also captured some very interesting feelings and moments of the conference. The facilitation was one of the topics that received the most criticism from the participants in the satisfaction survey. However, the participants' comments were very inconsistent: some complained that the moderation was too strong and that they were hindered by the facilitator; they wished the discussions were less formal and done more freely. On the other hand, some participants felt that the moderation should have been stronger. At the same time, some shy participants confided that they liked the method used by the facilitators because it allowed them to really participate in the discussion. A possible explanation to this variety of comments is that Wikimedians and chapters representatives aren't used to professional methods of management and moderation, and it will take some time for them to get used to it. Another complaint was that the facilitators didn't understand the community enough, and that they didn't have the "wiki" background. It is true that the facilitators didn't come from the Wikimedia community. However, they had some basic understanding of how Wikipedia worked, and they were briefed during hours by the organization team to make them understand how the Wikimedia universe works, what the relationships between the different entities are (chapters, foundation, community). Their performance was quite good overall given the complexity of the topics involved. A participant also conjectured that it was very difficult to moderate this conference because the participants formed "a group of very individualistic, fiercely independent people". The committees were introduced in Berlin as an opportunity to hold discussions in small persistent groups on specific topics. There was little preparation from the participants before the conference (Chapters meeting 2009/Committees). They met several times during the meeting and mailing lists were created for each of them, in order to foster collaboration. Wikimedia CH agreed to host these lists. A short satisfaction survey was handed out to all the participants on Sunday morning. The details are publicly available one meta-wiki. The comments were used to build this postmortem. Organize & plan early; almost all chapters work with volunteers and it is very difficult to get things done. Send individual e-mails & reminders. It takes a lot of time, but it saves even more time: people feel much more compelled to answer individual e-mails than e-mails sent to mailing lists. Be prepared to hear complaints: there are so many chapters with various needs, expectations, various levels of development, etc. that it is impossible to satisfy everybody's wishes. Having high expectations is a good thing, because it urges you to organize a good and successful event. However, be prepared to feel frustrated and disappointed when the outcome isn't what you expected because the participants didn't play their part. Even if you tried to satisfy everybody's wishes, you would need at least a whole week for the conference. Many Wikimedians (including chapters representatives) lack a professional background and can't work with deadlines & management methods. They want more time for presentations, more time for workgroups, more time for informal discussions, more time for social events, and more time for whatever is on the schedule. That just can't work. Wikimedia conference chapters meeting 2009 9456 by Guillaume Paumier (board) and Elke Wetzig (photo), under CC-by, from Wikimedia Commons.